Monday and Tuesday, a number of us Academy of Art University faculty and alums get a chance to paint at De Loach Vineyards, courtesy of the University and DeLoach Vineyards. 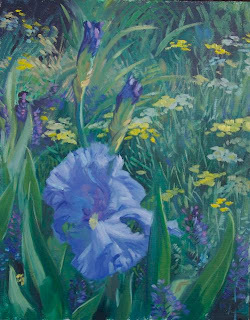 Summer greens should be upon us in the wine country, and I have augmented my palette to match wits with Mother Nature. 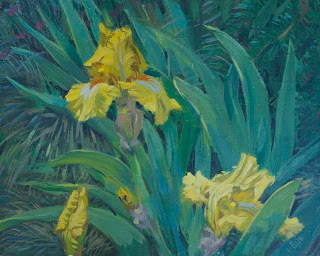 The colors and shapes promise the possibility of some good plein air work. 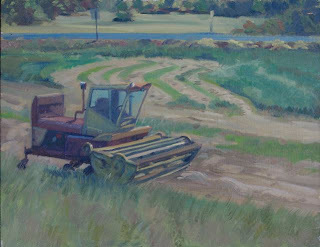 Works from the event get juried into a show at their vineyard. I am looking forward to this for sure! 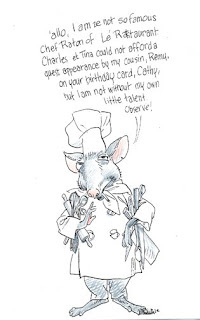 Cathy had a significant birthday, and, as I couldn't hire Remy from 'Ratatouille' to make a cameo for her ( she is in the cooking world) his cousin had to stand in... You have to wait for the punch line. 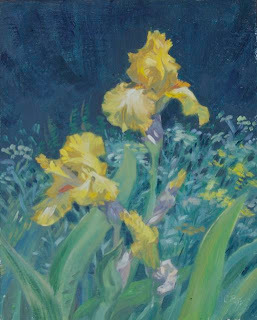 Irises. In my front yard, a warmup for the rest of SPA. Quite the challenge for me, as I don't normally paint flowers. Spring is just so beautiful. 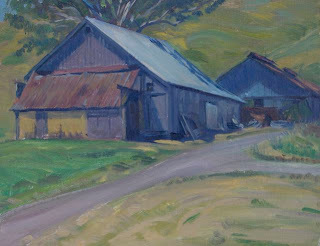 more sonoma plein air. These four were painted on last friday. 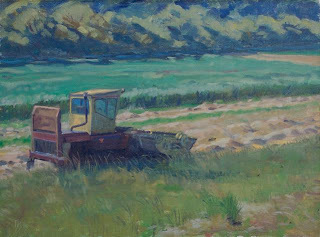 I so loved painting the combine in the hay field. I see it sitting there amongst the half shorn fields, awaiting the farmer's return. The contrast of shapes and colors just knocks me out. 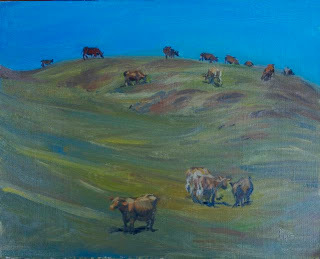 The cows were just fun to sketch as they walked, and the barn was a shot at making noon time look interesting. 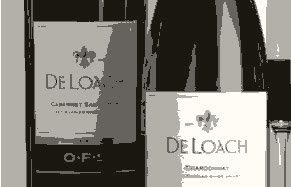 Shapes are the driver at that time of day. 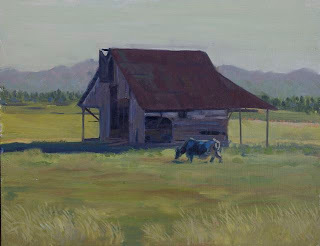 Sonoma Plein Air 2009 has come and gone. I got two and a half whole days to paint, for which I am deeply grateful. These show some of the work. Beauty of it is that it raises money for arts funding in Sonoma schools, k-12. In seven years, over 258,000 has been raised for art supplies, a boon to the schools as we found out the entire art supply budget for one school was $200, and the other school, where the teacher also taught, had ZERO. A travesty.